Yelp had a strong earnings report today, which you can read about there on Search Engine Land if interested. In short: revenues are up, losses down, and record-setting traffic. Yelp has 1.1 million claimed local business profiles. That came out during the earnings call. It’s the total number of claimed Yelp business profiles as of the end of Q1. The company said it’s a 58 percent increase over Q1 of 2012. How’s it compare to other services? Well, we know that Facebook most recently said it has 15 million Pages, but not all of those are local businesses — that number includes Community pages and other categories, too. As far as I know, Google hasn’t reported numbers in a long time. Back in December 2011, it said there were 8 million claimed Place Pages. I’m also not aware of how many businesses have claimed their Foursquare profiles, but I’d guess it’s significantly less than Yelp’s 1.1 million figure. 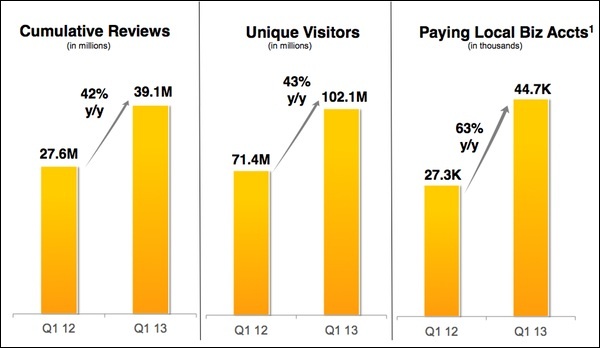 Here’s a look at some of Yelp’s numbers in visual form. So only roughly 4% of business owners who claim their Yelp listings also fork over for ads? It sounds like Yelp’s doing well, but that doesn’t seem like a great conversion rate, so I’m guessing they’ll just keep pushing the paid listings harder. Interesting stuff, Matt. Thanks for posting. I think another way that Yelp tries to push people to pay for ads is with their “filtering” of reviews. Whenever they think a review is suspicious they filter it and don’t show it on your profile. This has happened several times for legitimate reviews on my page. I think yelp assumes that people will pay for ads to increase their visibility. I think it’s fantastic that Yelp is converting some SMBs to the paid platform. It could be money well spent for the SMB, especially in the Hospitality vertical. I have had a number of calls trying to sell me Yelp services but have always been unconvinced. I know people with Yelp listings who not seem to get much from it, in fact I was talking to a client about this today who told me that in a year he has never had a lead from his listing. What to make of this? Are Yelp local business profiles effective in generating leads? Dave, I would assume that, as with most forms of advertising, some companies will do better than others. No doubt a lot of businesses are doing well with their Yelp business. « Foursquare’s Getting Aggressive in Asking For User Tips, Reviews, Etc.